The Big Game is a great excuse to throw a party and have some fun, and for many of us, the football game itself is just a sideline attraction to the food. When I host a big game party, I love serving finger foods and appetizers, and I always have guaranteed hits like chips, salsa and guacamole available, but this year I’m also doing a little something different. I’m serving Chicken Tacos with Avocado Corn Salsa. Since people looooove avocados (1.3 billion pounds of love annually), I wouldn’t dream of serving chicken tacos on my game day menu without them. Did you know that if you made guacamole from all of the avocados sold for Big Game XLVII parties, you could fill the entire stadium 12 feet high? That’s love, y’all. 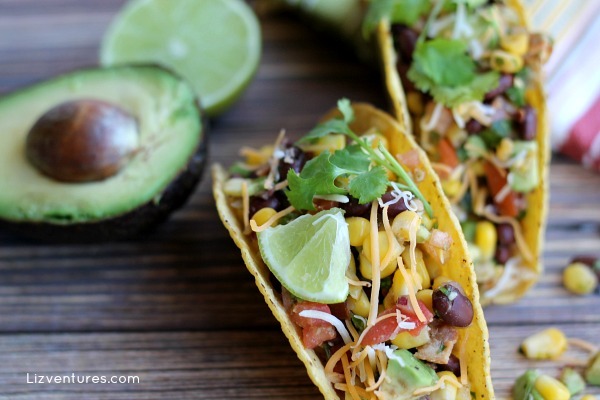 So, come on… let’s make some Chicken Tacos with Avocado Corn Salsa! Print out this coupon for $1 off (while supplies last) when you buy one package Old El Paso™ dinner kit, tortillas or taco shells and two Avocados from Mexico. You’ll not only save with the coupon, but you’ll enjoy in-store savings of 25% off Old El Paso™ products. (Offer excludes Old El Paso™ flour tortillas, dinner kits and frozen entrees.) The savings last through 2/4, so hurry! I cooked some chicken breasts and seasoned them with Old El Paso Taco Seasoning mix (hot and spicy), and then shredded it. I love that seasoning mix when I’m making tacos, but you could season it any way you’d like. Get the avocado ready! I like using Avocados from Mexico because they’re fresh, delicious, authentic, and available year-round. Combine the remaining ingredients in a large bowl and then add avocado, tossing gently to combine. Then, add the chicken to the Old El Paso Stand n’ Stuff taco shells, and top with the avocado corn salsa and a sprinkle of cheese. Cook chicken and shred with two forks. Season with taco seasoning, if desired. Set aside. In large bowl, combine remaining ingredients except for avocado. Add avocado; toss gently to mix in. To make tacos, add shredded chicken to bottom of shell and then spoon in the avocado corn salsa to fill shell. For more recipe inspiration, visit the Old El Paso and Avocados from Mexico sites, and don’t forget to snag your coupon while they’re still available! One lucky reader will win $15 Paypal cash so they can pick up the ingredients to make a recipe too! Taco Tuesday anyone?? These look yummy! Thanks for sharing at Welcome Home Wednesdays! See you tomorrow! 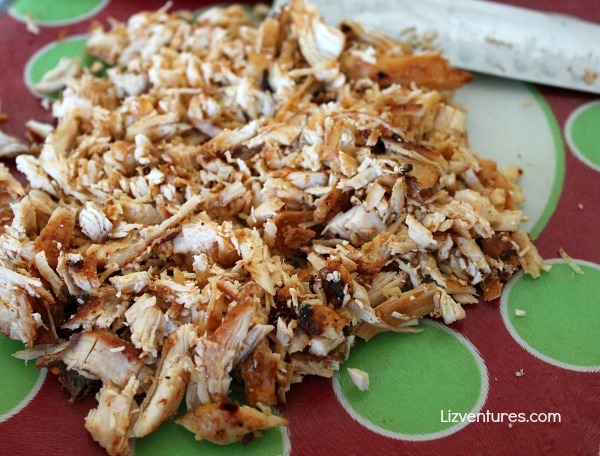 I pinned this delicious chicken tacos recipe! Wish that was my dinner tonight! Thanks for sharing it with us at the #HomeMattersParty this week. Thanks for linking up at Welcome Home Wednesdays! OMG these look DELICIOUS! I’m totally trying these out this weekend! Thanks so much for sharing at Merry Monday! Oh man! We are huge taco fans at my house. Thanks for sharing. Looks delish! 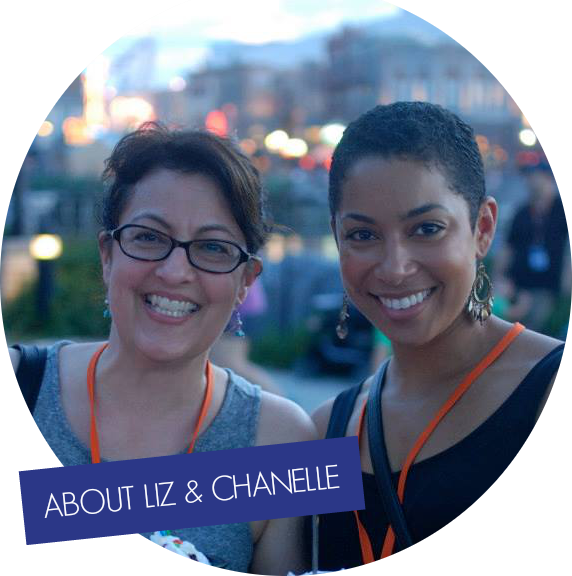 Thank You for the giveaway… we are going to try the Avocado Sage Cornbread recipe. From Old Del Paso I would make the Taco Pizaa rolls. I would love to try the Flank Steak Tacos with Mango Salsa recipe on my grandma’s birthday in March. She loves tacos and she still has a lot of mangoes in her freezer that came off her mango tree last year. I would love to make the Easy Cheesy Bean Dip, it looks delicious. I love nachos and dip! Thanks for the chance to win. 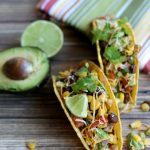 I would love to try the Sriracha Avocado 10 Minute Tacos recipe. My family loves Tacos. This would be a new twist – but I’m sure it would be a hit. I would like to make the Chicago Style Avocado Chicken Pizza. I would like to try the Slow-Cooker Carnitas. I think the mini 7 layer dips look fun. I also like that the portion is controlled. I like the Easy Grilled Nacho Pizzas recipe. Looks yummy! I would love to try the seafood guacamole recipe. Guacamole is a favorite of mine. 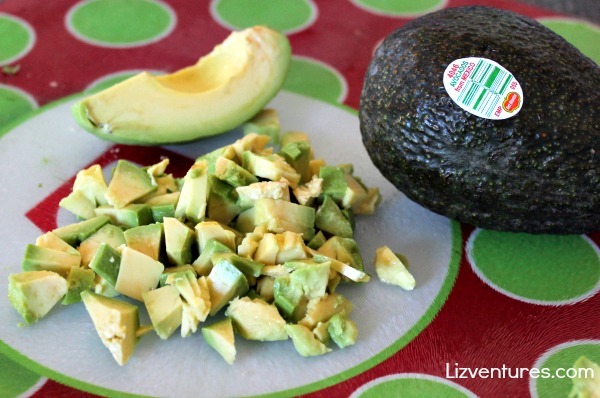 I love avocados and I’d like to try the Corn Relish with Avocados recipe. I’d love to try the Black Bean, Avocado, and Corn Salsa recipe. From the Avocado website, I’d love to try the Black Bean, Avocado, and Corn Salsa recipe. The double bean and cheese nachos would be a fun recipe to make and experiment with. I want to try the Double Cheese and Bean Nachos! I’d like to try the Enchilada Turkey Meatloaf recipe because when you read it, you’re like…what? Lol Something new and different to try, I’d like that. The seven layer burritos sounds good. The Sloppy Joe Tacos recipe sounds so good. Easy beef nachos, but I’d make them easier. I use Boca crumbles instead of hamburger since I prefer the taste and the ease of making it. I would like to try the easy beef nachos. Simple and tasty. I would love to try the double layer tacos. I would love to try the recipe Avocado Crab Melt. I would like to try the Cheese Steak Taquitos with Avocado Cream recipe. The Chicken and Black Bean Burritos look yummy! Oh the Enchilada Turkey Meatloaf sounds really good! We love enchiladas, but have never thought of a meatloaf ! Cant wait to try this one! I would like to try Cheesy nacho taco boats. We’re having our neighbors over for a taco bar today. Can’t wait to serve these. It was hard to decide but the recipe Avocado Crab Melt sounds amazing. Those tacos look amazing!! I love anything that has avocado in it. I’d like to try the Beef Bulgogi Korean Tacos on the Old El Paso Website. I just recently made a variety of Korean Beef Tacos for dinner in our home and they were EXCELLENT! I’d like to try the Chicken Tacos with Avocado Corn Salsa. It looks delicious!! That salsa is calling to me. Avocados are one of my (many) weaknesses. I could just sit with a spoon & eat an entire one. The A LA VERACRUZANA GUAC WITH PLANTAIN CHIPS sounds delicious. I love avocados so much, they are my favorite food. Cheesy Bacon Bean Quesadillas this recipe sounds so easy and really good. I’d love to try the cheesy bacon bean quesadillas. They sound delicious! I’d like to try the avocado coconut pie… it sounds strange, but interesting. I’d at least give it a shot once. I’d want to try the Mexican Buffalo Chicken dip recipe. It looks delicious and definitely different from the rest. This sounds so good! I love Avocados from Mexico, I always look for them. Avocados and corn on a chicken taco is honestly one of my favorite meals (it’s up there with a good beef and bean chili and a delicious spaghetti bolognese). Guacopedia sounds so yummy! I love avocados, which is crazy because I hated them as a kid. I want to try the Easy Grilled Nacho Pizzas. Looks so good and I know my kids would like it too. The Grilled Chicken And Avocado Salad from the Avocados from Mexico site looks so good! That would be easy and delicious. I’m so hungry! This looks mouthwatering!!! I love the cilantro leaves in it! I would like to make the Chicken, Black Bean & Avocado Tostada Bites recipe. Thanks for the chance! That looks so fresh and festive! I love tacos and avocados. Can’t wait to try this! I would like to try the Crab, Avocado & Watercress sandwiches, but I love avocado, so I’m sure I could find more to try. I would love to try the Easy Creamy Chicken Enchiladas. They look delicious! I want to try the Pineapple & Cucumber Guacamole. I have heard of pineapple salsa, but never guac, so I must try it! The Seven-Layer Burritos look way too good to pass up! I would love to try the recipe for Easy Beef Nachos. I would like to make the Garden Veggie Burrito. Since we all love avocados I’d like to make the Anaheim Guacamole recipe. I would like to make the Mexican Party Meatballs and the Easy Grilled Nacho Pizzas. OMGoodness…I would so make those tacos…they look delicious. On the Old El Paso site, the Cheesy Bacon Bean Quesadillas looked mighty fine! My family would love to try the grilled BBQ chicken and pineapple tacos. telling me which Old El Paso or Avocados from Mexico recipe you’d like to try. I would like to try the Easy Grilled Nacho Pizzas recipe. I want to try the Mexican buffalo chicken dip. this will be perfect for a party!! I definitely would love love love this recipe and I will not wait for a party to make it–I will make it for myself for dinner one of these nights! I would like to try the Easy Beef Nachos from Old El Paso. Another recipe I would love to try? I would try the two step chicken quesadilla with salsa. I often order quesadillas at restaurants, but I’ve never tried making them myself at home. I’d like to try the avocado coconut poundcake from the Avocados from Mexico site. I would like to try the flank steak tacos with mango salsa. It sounds really good. I would like to try the avocado corn salsa, it sounds really good. I really would like to try the Cheesy Nacho Walking Taco Boats. My kids would love it just for the name alone! I would like to try the slow-cooker carnitas. It sounds delicious, and easy to make in a slow-cooker. Thanks for the giveaway! I’m a guacamole addict, I would like to try the Carnivale Guacamole recipe. I would be most likely to try the BIG-TIME AVOCADO SALSA. That sounds really good. I usually just add avocado to my turkey tacos. I want to try Easy Grilled Nacho Pizzas recipe. Corn salsa is my favorite. This is a great sounding recipe, and a great way to have taco night when my DIL visits (she only likes chicken and fish). It was a hard choice, but I’d like to try the double layer tacos, I always have a hard time choosing between soft tacos and hard shell anyway! The Easy Grilled Nacho Pizzas sound yummy. I would love to try them. I am most interested in trying the Avocado mac and cheese recipe! Yum!!! The Spicy Mexican Shrimp & Avocado Cocktail looks delicious! I would like to try the CHICAGO STYLE AVOCADO CHICKEN PIZZA. I would like to try the White Chicken Enchilada Casserole. I would like to try the AVOCADO COCONUT POUND CAKE recipe. I’ve never used avocados for baking before. the Slow-Cooker Carnitas recipe sounds good. I’d like to try Easy Creamy Chicken Enchiladas. That sounds delicious and I love me some avocado! I’ll have to check out that seasoning as I need to find new ways of spicing up my chicken. I don’t know if I like avocado. I’ve never had it! The corn salsa sounds good. I love chicken tacos, these sound delicious! This looks amazing! My hubby loves avocados and so do my kids. I am going to have to make this for them! Thanks for sharing. I’d like to try the Blue Cheese Guacamole. You can never go wrong with tacos! I just browsed the Avocados from Mexico web-site, and another one of my favorite recipes is the Avocado-Coconut Pie. These look so fresh and delicious! I yearn for summer and wam days and delicious tacos! This looks so good, I’m addicted to avocado now. You can’t go wrong with chicken tacos and avocado. YUM! It was hard to pick just one recipe from the Avocados from Mexico site. The Tropical Avocado Salad looks good! I would like to try the Old El Paso Grilled Chili Chicken with Southwest Relish recipe. I’d like to try the spicy fish taco recipe from Old El Paso. Yum! I love this combo, especially with chicken. I think I’ll add this to our menu this week. MMMM. LOVE corn salsa so much!! When we have tacos I always use the standing ones. Why use regular?! makes no sense after you use the ones that stand on their own! I would love to try making the Easy Creamy Chicken Enchiladas. They look yummy. I want to try the Cumin-Rubbed Chicken with Avocado Salsa! I would like to try the Slow-Cooker Honey Lime Chicken Enchiladas. The sriracha avocado ten minute tacos sound delicious. Might have to get the stuff this week. I’d love to make the 7 Layer Dip from Old El Paso’s site. 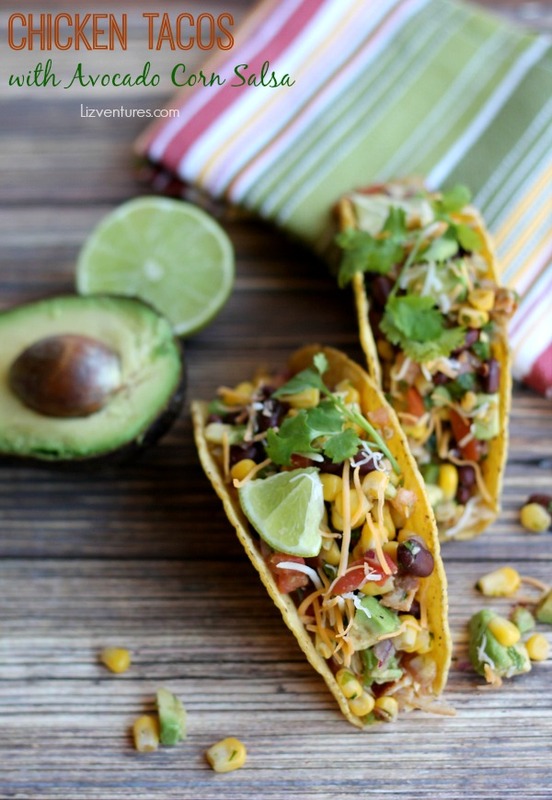 These tacos looks absolutely ah-mazing! Thanks for sharing your recipe! These sound really good, they have some of my favorite ingredients. This looks so good. The lime has to add a great refreshing twist to it. These look so,great! 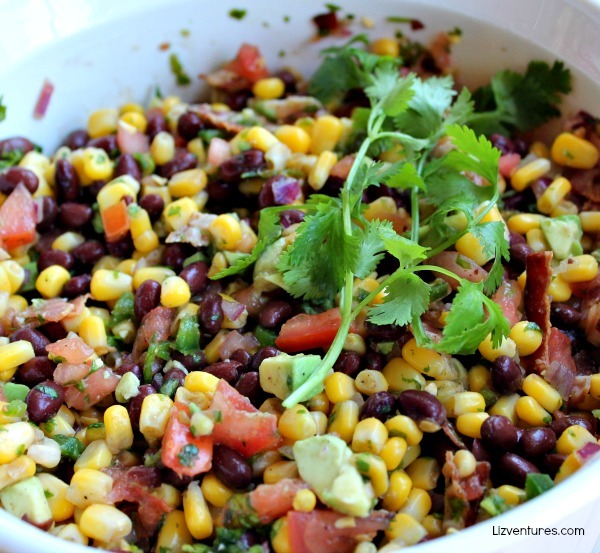 I have an amazing black bean and corn salsa recipe mi may have to throw in some avocados next time! This looks really good and right up my alley. I love tacos but I love the twist on them here, not to mention I love avocados. I think I want to try SUVIR’S AVOCADO PEANUT SUMMER SLAW. I’d like to try the Carnivale Guacamole recipe. We had chicken tacos last night but I wish i had that corn salsa on it. These look great! The avocado corn salsa sounds sooooo delicious!